Big Finish: Doctor Who - FROSTFIRE Review | Warped Factor - Words in the Key of Geek. The Companion Chronicles were a bold, bizarre and brilliant idea from Big Finish back in 2007 when they launched. Stories that would tell us mostly shorter stories that weren’t perhaps quite so much ‘Doctor Who’ stories, or were but allowed us to see events through different eyes, while expanding on what we knew about companions from throughout the show’s history. They began with Frostfire, a story told by Vicki long after she’s gone off to marry Troilus at the end of The Myth Makers, and if you’re going to start a range off with a bang, this is the sort of story you need to do it. 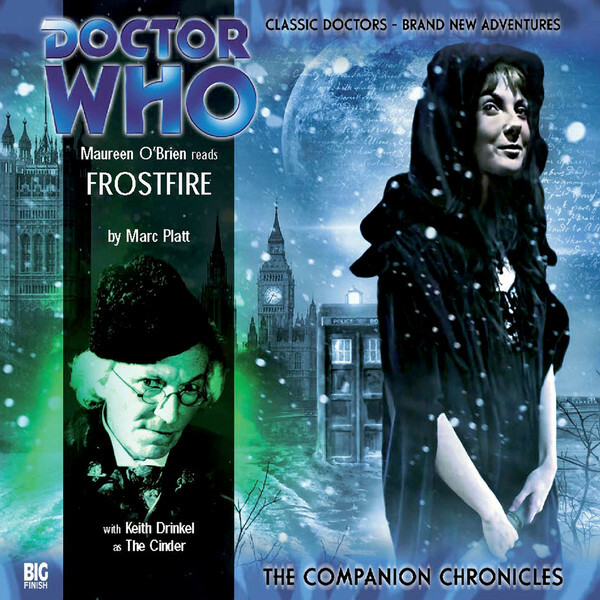 Frostfire is written by Seventh Doctor on-screen writer Marc Platt, and what it is above all is marvellously compact and complete – there are no dangling threads, no lines that lead nowhere, it’s all smoothed off like a perfect egg. Set in 1814, the year of the great London Frost Fair, when the Thames froze over and people from all walks of life enjoyed the frozen river as a carnival-space, it brings the First Doctor, Steven and Vicki into contact with footpads and fair-folk, as well as the upper crust and – throwing a celebrity historical into the mix, one Jane Austen, who proves herself full of vim and gumption as events unfold. It also works in an ancient earth myth, a touch of cyclic, Plattishly-twisted ouroboros fun, and a highly visual sense. With perhaps the exception of the episode 1 cliffhanger, this story is written and delivered in a way that you can genuinely imagine being recorded and filmed in the Sixties, and it wouldn’t suffer very much for the shoestring budget and the conventions of drama back in the day. It would fundamentally work, and you can imagine it being one of the great ‘lost’ stories of the black and white era. Interestingly though, while it’s rooted in Vicki’s personality and more particularly in her post-Tardis story, you could more or less tell this story in New Who too, without it suffering unduly. You could especially do that because Vicki, in her narratorial duties, is an older woman here, looking back on her life, and Maureen O’Brien kicks the range off to a cracking start by both delivering a relatively screen-accurate Vicki as a young woman, giving us the key into the story, and populating frozen London with a vibrant cast of characters in whom you can invest and believe. Gloriously, indeed probably irresistibly, Platt gives us an alien reason for the great freeze that makes the Frost Fair possible, while working in lots of possession-style shenanigans, a chunk of Regency society on which Jane Austen can report in her novels, and both a creeping sense of the alien’s influence and a solid chase sequence, Vicki and Jane running down the villain, albeit the Doctor is on hand to do psychic battle with the creature to technically defeat it. The final joy is that he actually doesn’t – sure of himself as the First Doctor frequently was, he overlooks something crucial, and it’s left to older Vicki, narrator-Vicki, to finally put the source of the trouble in its place, meaning she well and truly owns her companion chronicle. Along the way, she tells us something of her reasons for leaving the Doctor and marrying Troilus, tells us about her life with him, her children and grandchildren, and the occasionally ungovernable frustration of being a woman from the future among people from her distant past. Frostfire gives us an absolutely solid alien threat, brings young Vicki to the fore in the battle against it, teams her up with Jane Austen to beat the evil and free London from its terrible thrall, allows the Doctor and Steven their moments, and then materially adds to what we know about Vicki’s life after she left the Tardis, growing her up, showing her strength, her joy and her frustrations as she defeats the villain one more time. The Companion Chronicles was a range with many more ups than it ever had downs, but right back at the beginning, it announced itself with a story that was succinctly written, bringing tons of atmosphere to play and allowing the companion of the piece to shine. Check out Frostfire for all these things and an object lesson in just how good an actor Maureen O’Brien really is and has been all these years.